I love this race. This was one of my first races when I started running last race season and I look forward to it all over again as soon as my foot crosses the finish line. 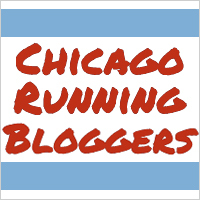 This is a good, small, neighborhood race to benefit the Lincoln Park Zoo. I met up with some friends before the race near the entrance of the zoo with the statue of the bear with a fish hanging out of its mouth looks down on passers-by. I actually ended up getting there earlier than the rest [mark your calendars and declare a feast day, this doesn’t occur often] and got to walk around the zoo for a bit to take in the sights. Animals: check. People doing last minute registration and on site packet pickup: check. Selling coffee to average citizens instead of just providing warm refreshment for volunteers (you definitely deserve some free coffee volunteers! Thanks for all you do!! ): check (I only saw iced though, hopefully there was hot coffee around with the temps and the rain that day). Gear check…check. After milling around for a bit to take in the sights and sounds of the zoo, I wandered back to our designated meeting place just as it started to drizzle. Cool, wind, and now rain? Wonderful. Still, not terrible out and I have run in worse weather (here’s looking at you freezing temperatures, wading through tiny ‘lake’ at Muddy Monk Double Down). Glad I checked the weather beforehand and wore pants. Two layers on the bottom and three on top as it was only going to get colder from here on out until well past midday. A tree acted as our umbrella while people started to arrive and we waited out our time till we could all huddle together at the starting line before being released to warm ourselves up to a temperature where the cool breeze and the moisture in the air would be a welcome refreshment rather than a reason to regret having worn cotton as one of several layers. The race was fast. I was not running at 10K race pace, as I expected to run 10 miles instead of 10 Kilometers that day. This was very difficult at times as everyone around me was running a different distance than I, and so a different pace. I purposely started out slow and made sure to keep my pace steady. Just think of it as an average Sunday long-run. Even when not running at a 10K race pace I managed to get a Personal Record for the race!!! When I saw this on crossing the finish line I was psyched that I still had four miles left to run and didn’t even feel drained! Apparently training has had some effect and I am both nervous and excited about next week’s Allstate 13.1 Half Marathon. 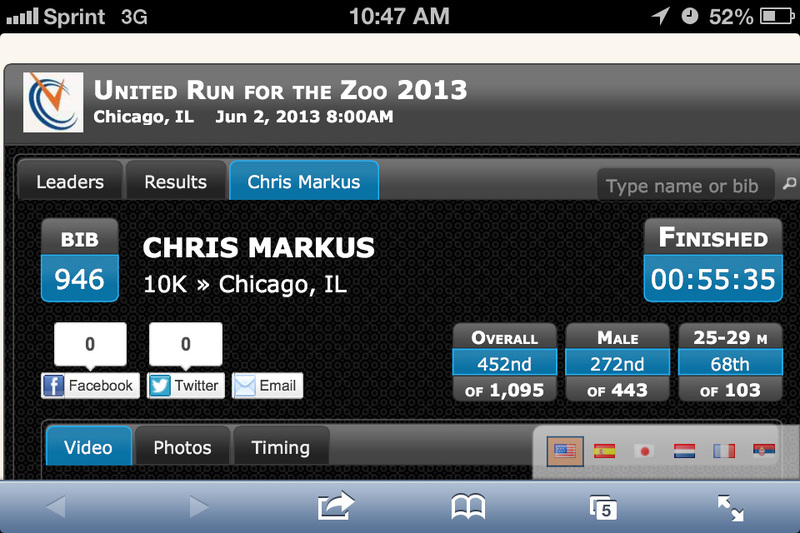 The Run for the Zoo was under pretty amazing conditions, cool with a nice breeze and a refreshing mist. Not much sun, but not downright gloomy. Not too many people yet enough runners to give myself the illusion of competing for something other than a warm, fuzzy, feeling of personal achievement. Who knows what lurks in the heart of next weekend? The sun may be shinning, but the ice could still be slippery. I am both looking forward to the upcoming race as well as hoping to soon have the relieving feeling of having my first half under my belt so that I may be able to look back and perhaps think that it either wasn’t so bad or at least know how I could have been better prepared. This coming week I will taper off a bit, get in quite a few less miles, in hopes of resting up a bit for the big event. Packet pickup – The packet pickup is by far one of my favorite non-expo packet pickups. 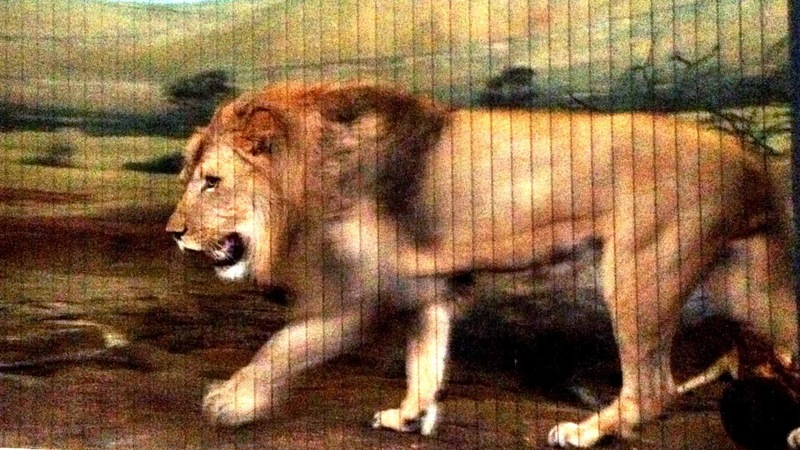 I mean, it is in a Lion House! You pick up your race packet in a room full of intelligent beings that can all outrun you and might even do it just for fun. Actually, come to think of it, this may actually be my favorite packet pickup even including expo’s. Gearcheck/Waves and Corrals. – Gear check was available and as it was raining, I’m sure quite a few sets of dry clothes and umbrellas awaited people in their stowed bags here after the finish. I knew that after the race I was going to run another four miles to get in my weekly mileage so I traveled light enough to be able to take off again as soon as I crossed the finish line and grabbed a water bottle. Plus, it is a neighborhood race, it just so happens that it is my neighborhood and so I ended up running home afterward. Then I ran to a restaurant for brunch; those poor people at the tables nearby that had to smell me after putting ten wet and windy miles behind me… As for waves and corrals, this is a pretty small race so there is really no need for corrals (a little over 1,000 in the 10K, not sure how many for the 5K timed or the 5K chipped, or the kids race), and waves only existed to separate different distances of race. There was a great distance between starting the 5K timed and the 10K (20 min.). After we were released for the 10K, the 5K fun run was released behind us. Well done Zoo. Course layout – Much better than last year! Last year I heard they changed the course (it was my first time running the Run for the Zoo last year), but this year they changed the course so it was a much better layout (perhaps they just changed it back). I really liked that we ran through the Zoo at the beginning of the race instead of at the tail end as the setup was designed last year. Finish line – Finish line was on the opposite side of the Zoo from the start so they really use the area around the Zoo well. People slow down far too soon after they cross the finish line more often than I would like, but still managed to navigate fairly freely away from the finish to grab a water, say hello to my friend and fellow blogger, then take off again for the next four miles of my run before heading out for some food. Love this race! Thanks! I just googled Athlinks as well, I definitely need to sign up for that! Should make keeping track of things a whole lot easier!